New! 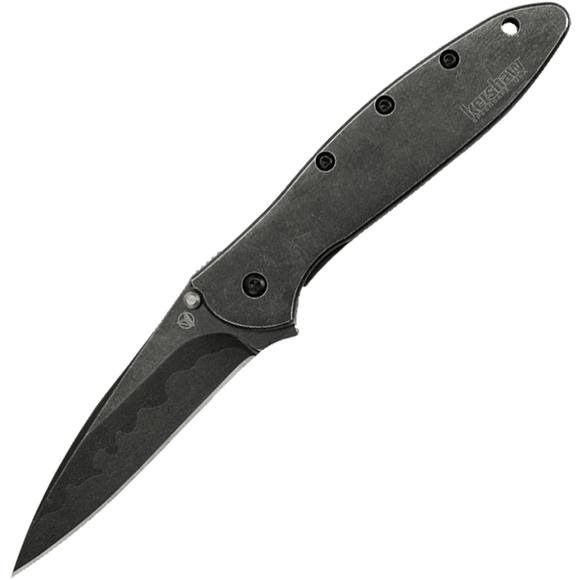 Kershaw's patented composite blade technology plus blackwash™. The first thing you'll notice about this Leek is the Composite Blade. The wavy braze line permanently joins a razor-sharp D2 cutting edge to a Sandvik 14C28N spine. The next thing you'll notice is the new BlackWash finish. With a Composite Blade and BlackWash, this is the Leek that has it all. New! Kershaw&apos;s patented composite blade technology plus blackwash™. The first thing you&apos;ll notice about this Leek is the Composite Blade. The wavy braze line permanently joins a razor-sharp D2 cutting edge to a Sandvik 14C28N spine. The next thing you&apos;ll notice is the new BlackWash finish. With a Composite Blade and BlackWash, this is the Leek that has it all. On the edge is a high-carbon, high-chromium D2 steel capable of taking and holding an incredible edge. On the spine is high-performance Sandvik 14C28N. With a composite blade, each type of steel is allowed to do what it does best. The Leek Composite BlackWash Folding Blade shares its 3-inch blade, slim, easy-to-carry design, and versatility with other Leeks. The BlackWash finish gives the Leek the look of a favorite, well worn pair of jeans-the ones you just can&apos;t live without. Once you own it, you may just feel that way about this Leek Composite BlackWash Folding Blade, too. The modified drop-point blade shape makes it a good slicing knife, while the slim tip gives it excellent piercing and detail work capabilities. SpeedSafe® assisted opening system makes it easy to open the knife one-handed, whether you&apos;re a lefty or a righty. A simple pull back on the ambidextrous flipper and the Leek&apos;s Composite Blade is ready to go to work. This Leek also features a handle of pure stainless steel, BlackWashed to match the blade.. A secure frame lock keeps the blade locked open during use and a Tip-Lock slider locks the blade closed when folded. The pocketclip can be configured for tip-up or tip-down carry and the handle is drilled to accept a lanyard.